Refurbishing a recently acquired barge as a step towards expanding the SLBM test and development program to the west coast. This, in turn, would suggest the development of a west coast SLBM infrastructure, research and development of new SLBM designs or the future deployment of a ballistic missile submarine with the West Sea Fleet. Salvaging the second barge for parts to maintain the originally acquired barge based at the Sinpo South Shipyard. Scrapping the second barge, but in the process allowing naval architects and builders the opportunity to examine the barge in detail. This would facilitate construction of similar types of barges of indigenous design. A critical component in any SLBM test and development program is the operation of at least one, if not more, submersible ballistic missile test stand barges. North Korea currently is known to have two of these barges. The first, acquired during 2014, is based at the Sinpo South Shipyard and used to support the development of the Pukguksong-1 SLBM and the experimental SINPO-class ballistic missile submarine. The second was first identified during April 2017 and is based at the Nampo Navy Shipyard on the west coast. 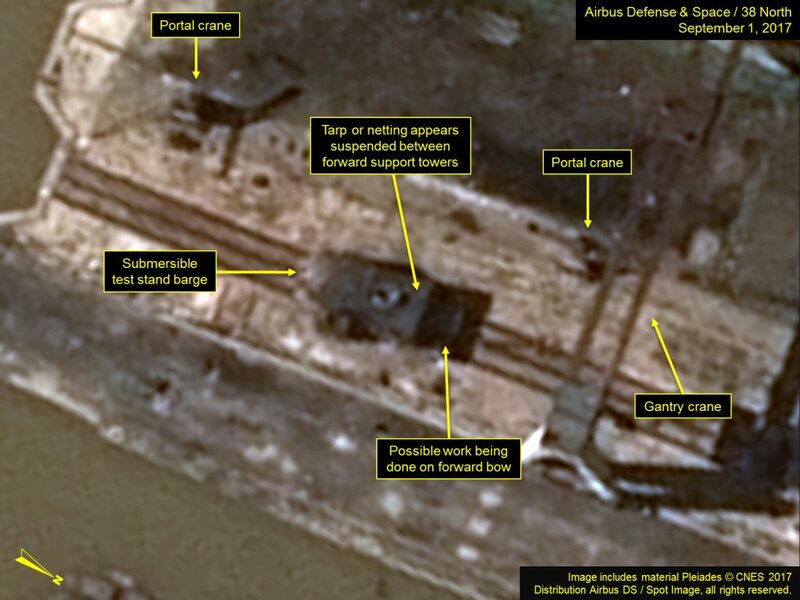 Both barges appear to be identical in size (~9 meters by 22.5 meters) and are very similar in size and layout to the old Russian PSD-4 test stand barges. 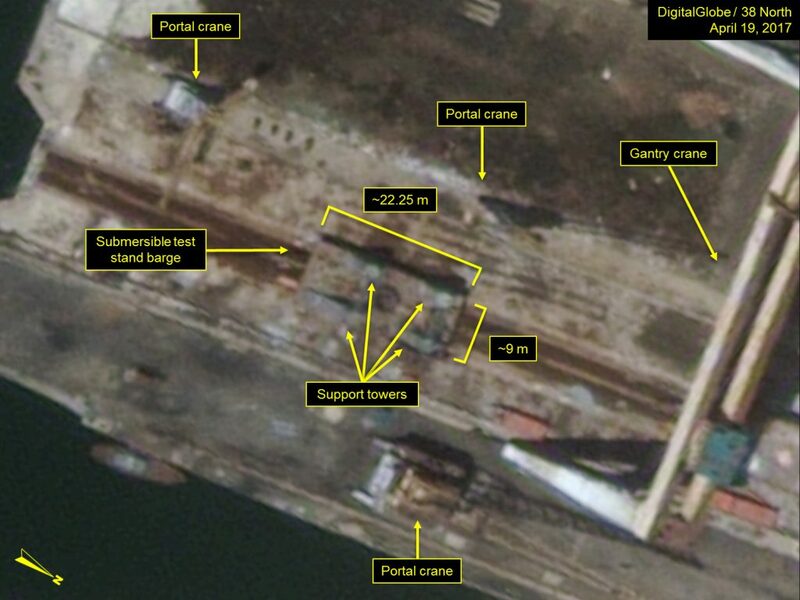 Based on satellite imagery from September 1, the Nampo barge has not been moved since our last report, but some construction seems to have taken place during the past five months on the barge’s four support superstructures and possibly in the area of the forward hull. Either a tarp or netting appears to have been suspended between the two forward support towers and may extend over portions of the forward hull. Neither the exact nature of the work can be determined based on the imagery alone, nor can we tell whether additional work (i.e., such as to the side or bottom of the hull) has occurred. 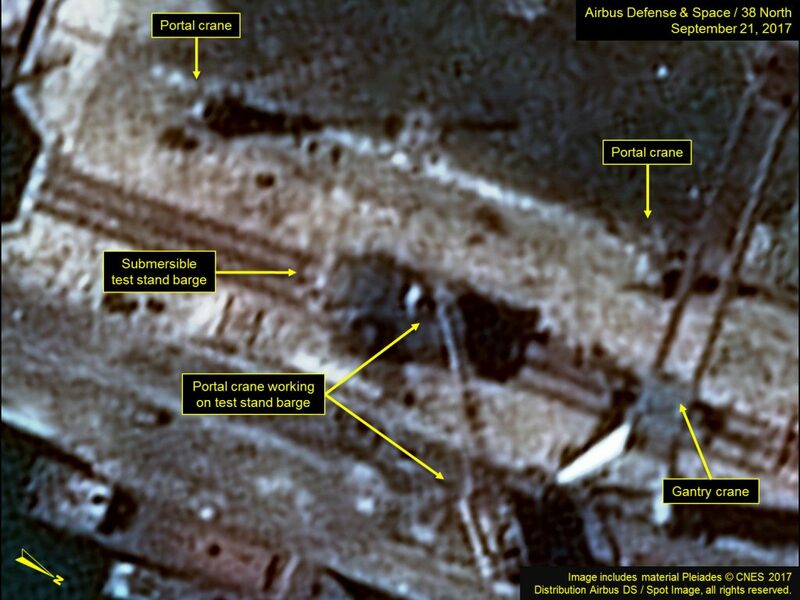 Imagery from September 21 shows the test stand barge in the same location but the portal crane on the east side is now rotated over, and work is being done on the barge. However, the nature of this work cannot be determined from the imagery. Clearly visible in all images is the central ring that is used to support a missile launch tube during testing. During a test, support cables are connected from the center and top of the launch tube to the four support towers. If the barge is being modified, rather than being scrapped, the diameter and height of the central ring may provide an indication of the size and class of missile it will be used to support during testing. Figure 1. While test stand barge remains in the same location as observed in April, some construction work has since taken place. Figure 2. Portal crane rotated and working on test stand barge.